As an early proponent of Tau Day (okay, it was a circle post on June 28th) I feel justified in calling for the establishment of a new Tau Day tradition. The Sharing of Sense! The whole motivation of Tau Day is to think about what makes sense. Pi is traditional, Tau is the product of reflection, a consideration of where we are now. There is room for both. 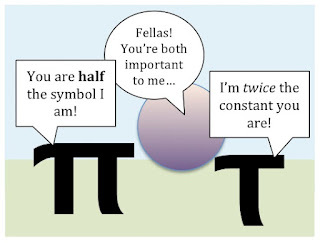 Of course Pi looks like two Taus, but it's Tau that's twice Pi. Typical math reversism. The tradition that makes Festivus the great holiday it is is the Sharing of Grievances, and this makes a good bookend for that. It has been a weird ten days. Dave and I filmed the now infamous video over a month ago, and it took me a while to get to the editing. He was patient with me as always. It took us a couple months to get to the filming. I expected a day of dust ups on Twitter, some people happy, some people unhappy, and that happened, though most were amused. Then Dan Meyer picked it up. Then Ed Week. Then Slate. And yesterday I was answering questions for the Chronicle of Higher Education. We've received great support, insightful criticism, boorish comments and threatening email. Crazy, then surreal, then bizarre. There are many people with deep emotions involved. It's like in Ken Robinson's first TED talk, people will pin you to the wall to talk about their education. Our primary purpose with this video was to get a conversation started. We realized that the satire would put some people off but many teachers have tried to engage Khan Academy in a reasonable discussion and present their case to the media about issues with this approach with little to show for it. Now that the conversation has started and Sal himself has said he is listening and looks forward to more critiques, the time has come to raise the level of the discussion. That is why several bloggers have suggested 101 Critiques and Lessons. We are looking for at least 101 bloggers to offer a video critique of a Khan Academy video and then share an alternative lesson on that concept. The goal is for all the participants to post the critiques and lessons on August 14th (the day before the deadline for the MTT2K prize). Perhaps the sheer volume of resources will convince the media to acknowledge that while Sal Khan's approach has it's place, he could still learn something from teachers. In the discussion with the Chronicle reporter, there were lots of questions about Mr. Khan, his academy and his videos, asked in terms of analyzing him, it or them as teachers/teaching. Not to me, anyway. If there's one idea I try to get at over and over (students chime in: "...and over and over") it's that teaching is more than the time with the students. Planning, assessment, and evaluation are a big part of it. And the time with the students is and should be so much more than the time when you're talking. The fundamental idea, for me, is that teaching is the practice of what we can do to support learning. Telling can be supportive, maybe, sometimes, with some other help. I did a project with Susan Walborn, one of my favorite teachers ever, before we went on to the Math Art festival. It was early on in my interest in math games. We got a group of 4th and 5th grade helpers who were struggling in math, to become teachers for 1st graders. We'd teach them the game for 15 minutes and then have the tutors play the games with small groups of the wee ones. It was often great. The tutors loved being the experts in an area where they had had so much negative feedback, they often benefited from some remediation on early number ideas they had missed, and they were so supportive of the 1st graders that it was often touching. If you can ask, don't tell. Thanks to everyone who's engaged politely in conversation about Mystery Teacher Theatre 2000, and I'm very grateful to the many who have been supportive. Image credits: Festivus Pole by M. Keefe at Flickr. More anthropomorphic comic at the tumblr. Hi John. Thank you for an insightful post on this interesting video. I was just introduced this morning to your original video and I loved it... absolutely loved it. I am a little stunned by some of the criticism of the video as smug, unfair or immature, mostly because I have the exact same feeling about some of the pro-Kahn advocates of their view of many classrooms. Technology is a wonderful tool (and neither you or your partner seem afraid to use it in a powerful way) but the way we criticize "traditional" classrooms with meaningless buzzwords (don't be a sage on the stage! you need to teach 21st century skills! you need more hands on!) is awful and as bad or worse of an offense. Keep strong.